Nehal El-Hadi interviewed Alondra Nelson, professor of sociology and gender studies at Columbia University. 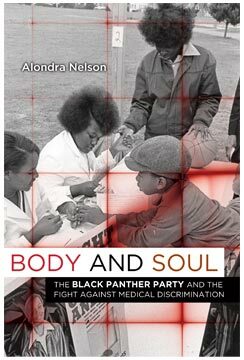 Alondra is the author of the award-winning book of Body and Soul: The Black Panther Party and the Fight Against Medical Discrimination, and a forthcoming book, The Social Life of DNA. The TRU was delighted to host Alondra Nelson, professor of sociology and gender studies at Columbia University. Alondra is the author of the award-winning book of Body and Soul: The Black Panther Party and the Fight Against Medical Discrimination, and her forthcoming book is The Social Life of DNA. In anticipation of her visit, Alondra agreed to be interviewed over Skype by Nehal El-Hadia (PhD candidate in the Planning program of the Geography department at U of T). Nehal El-Hadi is a writer, researcher, producer, and member of the TTRU. Her work explores the interactions of and intersections between communications technologies, the body, and place. She is a doctoral candidate in the University of Toronto’s Program in Planning, where her dissertation studies the ways in which women of colour use Internet technologies to create change offline. During the interview, Alondra and Nehal discussed the concept of “genealogical aspirations,” which Alondra will be expanding upon during her visit to the Salon. Please enjoy the full transcript of the interview below. NE In “Bio Science: Genetic Genealogy Testing and the Pursuit of African Ancestry,” (Social Studies of Science 2008) you introduce the concept of “genealogical aspirations” – could you please elaborate on that concept? AN Almost a decade ago, I started doing the ethnography of genetic ancestry testing in the U.S. for a book that will be out next year called The Social Life of DNA. I came to the project with a kind of technological determinism: I thought people would get these tests, the tests would tell them what their ancestry or their ethnicity is, and they would go about their lives with this information forever transformed. As it turned out, it was a lot more complicated than that. People come to genetic ancestry tests seeking information, and what the consumer or the user comes to that kit for is very much shaped by their histories, their personal desires, what they know and don’t know about their families, and in the case of the people I interviewed at the very beginning of this project, what they knew from doing archival genealogy. I went from having a kind of implicit technological determinism in the way I was asking the question, to appreciating that people come to the testing process with personal histories and aspirations, with hopes and with projects, and sometimes with activism that they have in the mind that they want the test to help them with. Even if you, me, and another person use the same genetic ancestry testing company and receive all the same result, what this means for our respective lived experience can be infinitely different because the aspirations that we bring into the test are very different. NE The market for ancestry testing seems to be an incidental market, not an intended one. What possibilities lie in this technology for radical action? AN In the US, activism has become bureaucratised, so what used to look like a radical social movement or a social movement organisation – like the Black Panther Party for example – now these sorts of organisations or movements are more likely to be NGOs or different kinds of bureaucratic organisation forms as opposed to grassroots activism. What’s more, the bureaucracy extends to how protest can happen. If you want to have a protest today in New York City, you have to go down to City Hall, get a permit and permission from the state to march. You have to tell the city between what blocks you’re going to march on 5th Avenue, you have to tell them where the march is going to start, where it’s going to end and what time it’s going to take place. At the same time, activism has been increasingly criminalised. Activists are literally criminalised because they can be jailed for being radicals and can be given extreme sentences. What’s interesting to me about the use of genetic ancestry testing in contemporary politics is that is shows once again that activists are ingenious and imaginative and inventive. One radical possibility is how the activist imagination is galvanized even when activism gets hemmed in by the state through bureaucratisation and criminalisation. Radical possibility lies in how people find other ways of using what they can use to make claims to challenge power in their communities. And the iterative nature of the what-if in black politics: what if we tried this?, what if we imagined this?, why not do this?, is really powerful. You certainly see that in the more expressive and poetic veins of Afrofuturism, and I think you see a little of it in the unexpected uses of genetic ancestry testing, the political uses of genetic ancestry testing by Black communities. NE There is this awful history of the black body and genetics and here you have this use of genetics in a very different way in the African-American experience. AN To me, that is the unifying thread that runs through both Body and Soul and The Social Life of DNA. I am very much a product of a lot of work in the 90s that dealt with racialisation in science: topics like the Tuskegee syphilis study, eugenics, scientific racism. Books like Ian Haney Lopez’s White by Law, Stephen Jay Gould’s The Mismeasure of Man, William Tucker’s The Science and Politics of Racial Research, and Dorothy Roberts’s Killing the Black Body. These books were really formative to my graduate education, and what they shared in common was that they were macro-institutional looks at how race was made from above. As someone who grew up in the United States and grew up learning about the Civil Rights movement against racism and segregation here, I thought it simply couldn’t be the case that these institutions, these racist scientists, were making race and making justifications for racism without anyone in black communities saying anything about it. If people were working hard enough to construct this pernicious narrative about Black people and Black bodies, something had to be going on in response to that. I think inquiry into these African American responses to scientific racism is pretty underdeveloped in black studies, besides work on black doctors and nurses (e.g. Darlene Clark Hine’s historical work) and a few well-known works by W.E.B DuBois. I wanted to think about genetic ancestry testing as a potential legacy of scientific race-making, but also as a possible response to it. In the piece in Cultural Anthropology – I describe that the people I interview are actually very knowledgeable about the history of scientific racism and what that’s meant for black communities in particular. How it’s justified a lack of medical care, medical experimentation and abuse, and social control through medicine under the guise of scientific research. But these same people said, “we think that we might be able to do something else with the science. What if the science could be used for liberatory ends?” And part of what The Social Life of DNA looks at is one of the reasons these tests appeal to people of African descent: many of us know so little about our ancestry and that lack of knowledge is based in forms of colonial oppression, historical oppression, and the decimation of archives. We risk having doubly subjectified or subjugated populations, in the sense that being of African descent or of colour or from a postcolonial society means that you may not know much about your background. It makes you particularly vulnerable to using tools that might be dangerous to try and find out anything because you hope that this information might shore up your identity in a way. But at the same time, I think that what the work shows is that people can be very savvy about and very cognisant about this past, and also think that they can use these technologies in ways that might be beneficial. NE In Our Posthuman Future, Fukuyama cautions that currently there aren’t appropriate agencies and organisations to monitor and regulate medical technological research such as genetic testing. Do you think that what’s happening currently with the FDA and 23andMe is an example of this? AN I think that’s exactly right. What’s been interesting to me over the last decade of studying direct-to-consumer genetics is that there’s been a profound regulatory lag. What in part prompted the concept of “The Social Life of DNA” (besides my obvious debt to Arjun Appadurai’s important work on the social life of things), was my encounters with some scientists and their reactions when they learned that I was working on genetic ancestry testing. I heard things like: “you study genetic ancestry testing? Well, that’s not real science and it’s recreational, and everyone knows it’s just a hobby, a leisure pursuit.” But by the time I discover that these tests are being used by reparations activists, I’m thinking these tests are not just fun and games; there are real political stakes for people. Moreover, genetics always “spills over.” So if you do genetic testing in a criminal justice or forensics study, a medical setting, or ancestry testing, genetics testing always implicates people who are biologically related to you. I started to see spillover between these various domains (forensic, medical, genealogical, etc.). In the UK and the US, within the criminal justice domain, they were beginning to use a technique called “familial searching”. There are DNA databases of people who have committed crimes (and increasingly of people who have merely been arrested or detained). The state has the jurisdiction and the authority to do so. If biological evidence is left at a crime scene, authorities can attempt to find a match in their database. What familial searching, some states are now permitted to search for partial matches, to look for people in the database who might be related to someone who has been arrested or who may have committed a crime. DNA forensics is an imperfect science. And, now we also have the creation of “potential” suspects based upon biological relatedness. Because that the criminal justice system is racially discriminatory, the DNA of persons of colour are disproportionately contained in these databases. This means that these person’s relatives may be disproportionately scrutinized by the state. This is one example of how the way in which DNA ancestry works is not recreational in the least; it’s gravely serious. With regard to 23andMe: the FDA is interested in the health-related testing that they’re doing, but some of the markers that they use to make claims about ancestry may also be informative about health and vice versa. This is another example of domain spillover. We have these institutional domains and boundaries. There is a lot of boundary work being done to keep the different types of DNA tests in their distinct domains; and this boundary policing is partly carried out by regulatory agencies like the FDA. But the implication of “The Social Life of DNA” is that DNA does not necessarily abide the kind of boundaries that we try to put around it. There’s an inherent material quality to DNA and this characteristic means that genes circulate in places we expect and in places we don’t. Next Entry Upcoming event :: Alter Life: Biology + Technology + Art?